It can be a long but worthwhile journey to reach Bardia National Park from different locations of Nepal. Here's how to reach Bardia National Park by bus. Out of its 11 national parks, Bardia National Park is one of the largest (more than 900kms) and most visited ones in Nepal. One can go for a walking or a jeep safari at the national park and closely experience the wildlife which comprises of many animals including tigers and rhinos. Bardia (also spelled as Bardiya sometimes) National Park is located in the Western Terai region of Nepal. In this guide, I will explain how to reach Bardia National Park by bus from different popular locations of Nepal. 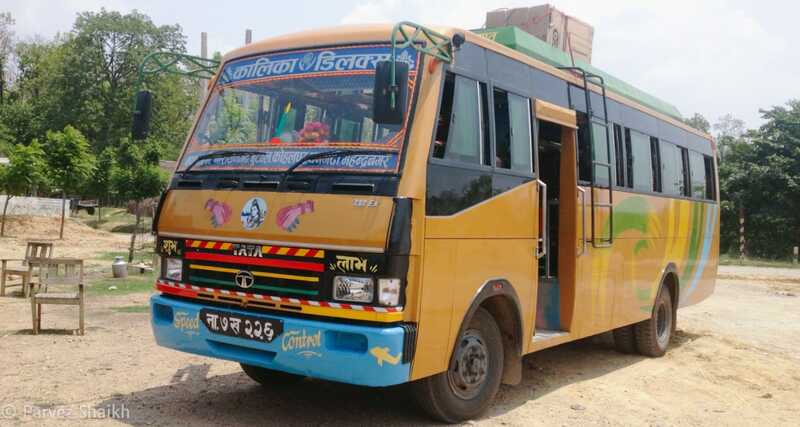 Local bus service is probably the best and most reliable way of getting around Nepal. There are no trains in Nepal and car (or taxi) rides can be an expensive affair. Even if you choose to take a plane to reach Bardia National Park, you will still have to take a bus from Nepalgunj airport. It’s best that you stick to the bus service for a safe, reliable and cost-effective way of getting around Nepal. Ambassa is the closest place from the national park in Bardia where most buses will drop you. In order to reach the Bardia National Park by bus, you will have to reach Ambassa first and then continue towards the park – which is about 12kms from Ambassa. Most travelers coming to Nepal via the Banbassa – Bhimdutta (Manedranagar) border will find this the most suitable way to reach Bardia. Bardia could be your first destination in Nepal (or second, if you wish to visit Shuklaphanta National Park) if you are entering from this route. To reach Ambassa from Bhimdutta, you will have to catch a bus from the bus park, commonly known as Mahendranagar bus park. Look for a ticket counter here and ask them for a bus that goes towards Ambassa. It takes about 4 hours to reach Ambassa from Bhimdutta. It’s best that you take the morning bus so you have time to reach Bardia before evening. Buses run all day from Bhimdutta so whatever time you decide to leave should be okay. The bus I took departed at around 8 in the morning and I reached Ambassa at around 12:20 in the noon. The ticket cost was 360 Nepali Rupees. If you are in Pokhara, you can take a bus that runs between Pokhara and Bhimdutta. This bus will stop at Ambassa. Usually, the bus leaves from Pokhara bus park at 3:00 PM. This will be an overnight bus and will take around 12 to 14 hours to reach Ambassa. The duration of your journey will depend on the weather and the condition of the roads. So be prepared for a long journey. Same as Pokhara, you can take a bus that goes towards Bhimdutta from Kathmandu and stops at Ambassa. I have heard there are direct buses between Kathmandu and Thakurdwara, too. Thakurdwara is the nearest village from Bardia National Park and if you find a bus, you can arrive directly to Thakurwara and then proceed towards your place of accommodation. A bus ride from Kathmandu to Ambassa can take up to 17 hours. Make sure you find a comfy seat for this long journey. It can be a really long and tiring journey to reach Bardia from Pokhara or Kathmandu. I would suggest that instead of taking a 17 hours journey, you divide it into two and reach Lumbini first. Spend two nights in Lumbini, visit the birth place of Lord Buddha and monasteries around it in a day. After this, continue your journey towards Ambassa. To reach Ambassa from Lumbini, you will have to change a few buses but it will be worth it. There are direct buses to Lumbini from Pokhara and Kathmandu. If you aren’t able to catch one, you can take another bus from these two cities to Butwal. From Butwal, look for a bus that goes to Lumbini. I’m pretty sure you won’t be able to find it, so you better board a bus that goes to Bhairawa (cost: 50 rupees). From Bhairawa, board a bus that goes to Lumbini (cost: 40/50 rupees). After you are done exploring Lumbini and are ready to continue your journey, repeat the bus route taken earlier in reverse order. From Lumbini, take an early morning (6:30) bus to Bhairawa and then a bus from Bhairawa to Butwal. From Butwal, take a bus headed towards Bhimdutta and reach Ambassa. The bus fare from Butwal to Ambassa should be around 600 rupees. I know this can be quite hectic to change buses frequently, but if you aren’t okay with a single bus ride of 15 to 17 hours, this is your best option. And Lumbini is also a nice place to relax and seek some spirituality. Tansen is another beautiful location worth stopping by. This small town is home to some historic places, temples and has a wonderful weather. If you’re coming from Kathmandu or Pokhara, you can take a bus that goes to Tansen and spend a few days (two nights’ stay should be good) there before you continue your journey. It will be a relaxing time out there in Tansen. To reach Ambassa from Tansen, you can take a bus from the Tansen bus park to Bhimdutta (Mahendranagar). Visit the ticket counter a day ahead (or at the time of your arrival in Tansen) and ask for the bus time. Also, ask them if you can pre-book the ticket. Then be present at the bus park at said time and board the bus. Okay, so you have made it to Ambassa, huh? Now your final destination – Bardia National Park is just a few kms away. Once you reach Ambassa, you can take a bus that goes inside the village. It will drop you about 2kms away from the national park and the cost will be 50 rupees. You have already gone through a long bus journey, so you might want to skip the last one. When you board the bus to Ambassa, call your host at the place where you will be staying about your departure. Ask them to pick you up from Ambassa, and tell them the number of persons they are supposed to pick up. Once you reach Ambassa, they should be looking for you. Just give them a call again and let them know of your arrival. The Bardia National Park is about 12kms from Ambassa. Some parts of the road was under construction during my visit and it was a bumpy, off-road ride on a two-wheeler. In some cases, you might be able to find a ‘lift’ from Ambassa to Bardia. If you’re traveling alone, someone might come on a two-wheeler asking if you want to go to the park. If you agree on a fair rate, you might want to ride with the person. I don’t recommend it, though. It can be quite a long and tiring journey to reach Bardia National Park by bus from different places in Nepal. But if you really wish to explore the national park and possibly spot some tigers and rhinos, too, then a trip to Bardia National Park is a must. Bardia is also a very relaxing place to be in Nepal. Surrounded by natural beauty, the village near the park is worth having a walk around. Meet some locals, enjoy the sunset from the sunset point, or simply relax at your place. I’m sure you will love to be there. Where to stay in Bardia? I recommend you check out Bardia Wildlife Resort (aka Paradise), a family-run cottage-style place well worth your time and money. Read my detailed review here. How did you reach Bardia National Park? Know a better way to reach there? Share your knowledge! Okay, ladies and gentlemen, this was Parvez and you were reading a guide on reaching Bardia Natioal Park from different locations of Nepal by bus. I hope you found this guide useful and I’m sure you will have a great time there. Great info. Can you tell how frequent the buses are from butwal to Lumbini, from butwal to Ambassa please as I and others surely would hate to arrive and get stranded as the bus is only once a day and we missed it! Both Butwal – Lumbini and Butwal – Ambasa are popular routes with frequent buses throughout the day at regular intervals. I am not sure about the frequency and whether there are night buses for these routes. But you will be able to find buses during the daytime. If we decided to go from Tansem – are the buses leaving in the day and arriving by nightfall – say no later than 9 or 10 pm? Might be nice to have a place to go to rest after the journey – how many hours is that journey from any experience you have? Hi Alan. The duration varies greatly on curvy roads of Nepal. It’s better to check the bus timings and duration at the bus park in Tansen. You may also be able to buy a ticket (I suggest an early morning bus) a day or two prior to your journey to Ambassa. I also suggest booking an accommodation beforehand and ask them to pick you up from Ambassa. Tell them which bus you are taking and they shall be there to pick you up in a vehicle.